We’ve been told over an over again that global warming would melt the icecaps, and melt Greenland, and that would result in catastrophic sea level rise flooding cities. 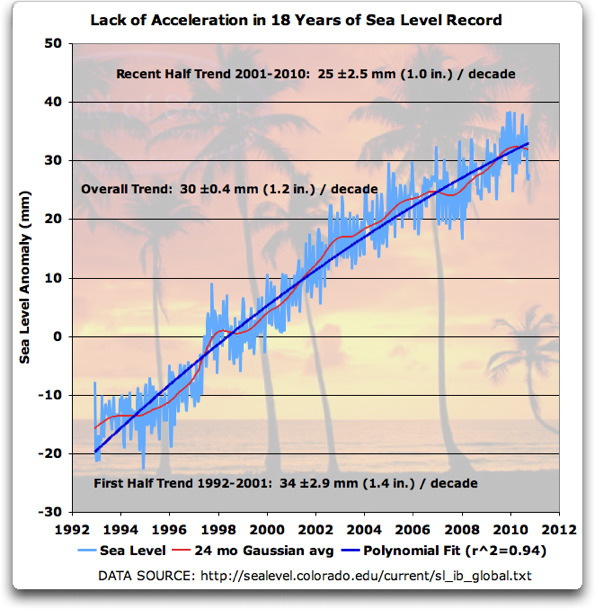 We’ve also been told that “sea level rise is “accelerating” but in an investigation done here on WUWT by Willis Eschenbach, Putting the Brakes on Acceleration, he noted in 2011 that there seems to be no evidence of it at all, and notes that sea level was rising faster in the first half of the record. Figure 1. Satellite-measured sea level rise. Errors shown are 95% confidence intervals. Data Source.